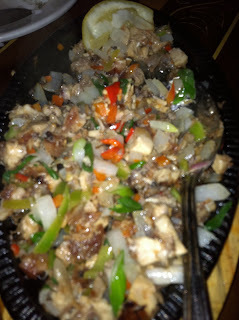 Pork Sisig does not sound the most appetizing on the menu - pig cheeks, ears and snout in lime & chilies. But served up hot and crispy on the sizzle plate, it is the perfect texture with the right amount of lime/spice. This dish is memorable for me because it was one of the entree's Jess and I had at Purple Yam before she departed from London! She also suggested it when I was hesitant about ordering this. It's one of the most delicious asian comfort foods I have ever eaten.